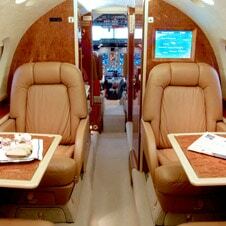 The Hawker 750 is a mid-sized aircraft with good range and features a stand up cabin. Cabin facilities are excellent with a fully enclosed washroom, a flight attendant service and a galley equipped to provide hot and cold catering. It is usually configured for 8 passengers and has a range of up to 4 hrs 30 minutes. An additional feature of the 750 is that it has an exterior luggage hold which is not available on the other Hawkers.